Yoga is known to focus on posture and breathing during its many routines, but it also puts emphasis on mental focus, which can help during asthma episodes. Learning to focus, stay relaxed, and remain calm during stressful times can help improve lung functions and help sufferers during an asthma attack. Yoga is also wonderful for those who suffer from arthritis because it is a very low impact exercise. It involves long, fluid movements and the main focus is on controlling the body’s movements. This in turn can help to ease pain, loosen stiff muscles, increase mobility, and reduce symptoms of arthritis in the joints. Many medical studies have been conducted and a lot of research has been done on the effects that yoga has on back pain. Many of these studies have pointed to yoga as a helpful step in reducing back pain. Yoga and the associated mediation that comes with it helps prevent back pain by accentuating good posture and improving overall muscle tone. People suffering from hypertension and stress are often very surprised to learn that they can find relief in the calm relaxation and meditation practicing yoga offers. Stress is a leading cause of hypertension and yoga has been shown to be a simple and fun way to reduce levels of stress. As you focus on the yoga moves with the slow and focused motions, it has been shown to help improve hormone levels and help reduce symptoms of depression and anxiety. While depression and other mental disorders are not just all in your head, improving your mood and shifting your focus can be a great way to start fighting these mental down times. Some studies have been done recently that suggests having yoga as part of your weekly exercise routine can help regulate hormone levels that affect your inner clock and sleep cycles. This means longer periods of sleep at night and better and more beneficial sleep. To keep your body functioning well as the complex machine that it is requires proper nutrition. From the foods you eat to the supplements you take, your body can better process and use the nutrition you consume with the help of meditation and yoga routines. Improve blood and oxygen flow and rid the body of harmful by toxins and by-products. It takes patience and a lot of practice every day to master yoga and to control your body. This is one of the big tenants of yoga that appeals to people the most and it helps teach patience and perseverance. These are things that everyone can use in any part of their life. Patience can be applied to any aspect of life and is one of the most versatile of all the benefits yoga offers. Mediation is an important part of practicing yoga and has been shown to be helpful in bringing the body back in line and to help regulate bodily function. Many important hormones level can be balanced through meditation and yoga practices, and this in turn helps regulate bodily functions and mental process that rely on these hormones. Staying focused is also one of the most important core tenants of proper yoga and mediation practice and mastery, and this can serve you well in just about all other areas of your life- especially at work and school. Tap into your body’s natural chakra flow and see how easy it can be to revitalize yourself quickly and easily. Give yourself a powerful boost of energy that lasts longer and that is better for you than energy drinks and other sources of caffeine. Natural energy generated by the body is better and lasts longer, giving you the power and motivation to get through whatever the day throws at you. With better mental focused and improved blood and oxygen levels throughout the body, the brain can be better prepared to work hard and tackle whatever tasks and challenges you have ahead of you. The mind can be sharper when you are more focused and calm and paying attention to your inner self, rather than the stress and pressures of the world around you. You’ll be able to think logically, plan ahead, reason more clearly, enjoy mental challenges, and tap into hidden brain power like never before. It is all made possible through regular yoga practices and routines that you make a part of your weekly schedule. Mediation and yoga can really go a long way in helping you be more self-confident. This is accomplished by demonstrating in a powerful and positive way that you can fully and completely restore your mind and body. Seeing how you can control your body to move and bend in the ways you tell it to can be the confidence booster that people need to start trying out other new and exciting things in life. 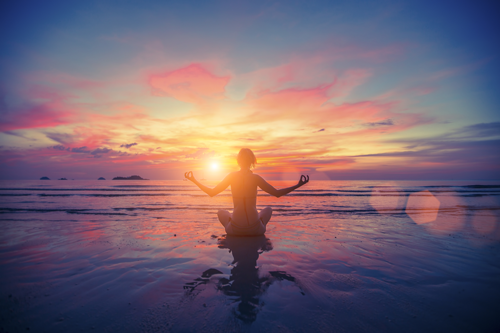 Yoga is a great way to boost confidence levels for those who are not normally very active or outgoing, and this can carry over into many other areas of life as well. With these eight benefits in mind, consider adding a few yoga routines to your weekly routine and discover the benefits it an offer! Whether you are just starting out or have been practicing yoga for a while, the benefits will come. The best thing is that you can find many ways to add yoga into your routine. You can get DVDs to work on at home, find videos online that show you how to add new routines, or you can find a trainer or class that is offered at a loyal gym or fitness center. However you go about it is not as important as actually getting into the habit of practicing yoga on a regular basis so you can enjoy these and many other amazing benefits.